ST. LOUIS, Dec. 6, 2018 /PRNewswire/ -- In tree nut orchards and vineyards, the only thing a manager wants to grow is that crop. Every other plant simply steals nutrients and water, challenging yield goals, robbing profit. That's why pre-emergent herbicides are foundational to successful grass and weed management programs in tree and vine crops. "Weed control is huge in a production ag system," said Ryan Garcia, PCA/CCA with Salida Ag Chem, Hughson, California. "Weeds are stealing everything we give to the crop – our water and our nutrients. So, if we are fighting weeds then we're fighting to get a good crop." In weedy situations, that fight continues through the season because unwanted grasses and weeds harbor insects and interfere with harvest, pointed out Dave Vermeulen, PCA/CCA, Vernalis, California. Yield impact is highly visible at harvest. "Weeds in the field interfere with being able to blow nuts out of the strips. If you have weeds in the centers, the pickup machine may have problems picking up the nuts," Vermeulen said. With an end goal of making a profit, growers look for products that provide a unique mode of action for resistance management, are easy-to-use, effective and offer a return on investment from increased yield potential. A long-term residual contributes to that equation: reducing costs with fewer applications and extending weed-free growing time. Recent replicated trials in California show the potential residual of three different weed-management programs. 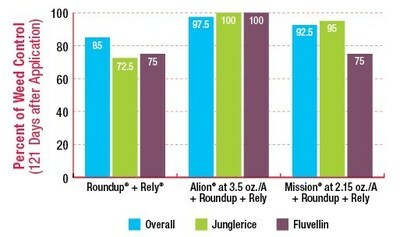 With up to six months of residual activity, Alion® also offers control of a broad spectrum of weeds and grasses, none of which have documented resistance to the active ingredient in Alion. A short PHI and low-use rates add flexibility to a grower's weed management plan. "I use the full range of products for weed control," said Aaron Piazza. "Alion, I think, is the best pre-emergent that we've ever had. It's the only thing that you can spray on in January that seems to make it all the way to harvest. It's very broad based. I use a lot of Alion." Hear California PCAs and growers talk about best practices that deliver the value they need for weed control. For additional information on controlling weeds in permanent crops, talk to your Bayer representative or visit AlionEndsWeeds.com.